Eating plant-based doesn’t mean you will be living on rabbit food. Yet, I will be telling you about the benefits of CARROT juice in a second. Rabbits eat carrots… YOU should eat and DRINK carrots… I am not winning this argument am I? Here me out first. Once you see the impressive nutritional benefits of carrots, before you know it, you will be juicing bags of them. Carrots are not only beautiful and sweet, but they are also incredibly healthy and healing. By juicing them, you can immediately receive all their amazing nutrients. When you think about good digestion, you may only think about the comfort of having a good poop, no constipation, no bloating, no gas and so on, but healthy digestion is more important than that. Healthy digestion is necessary for the proper absorption of nutrients in your food. Drinking carrot juice stimulates the secretion of digestive juices so that your body can benefit from all the macro- and micro nutrients you consume. The fiber content also feeds your good bacteria, keeping the bad bacteria in check and in balance (it is still beneficial to take some probiotics to help aid healthy digestion: check out our amazing Biotic Balance Probiotic at our new store!). You heard it as a child and it’s true: carrots are good for your eyes. The reason for that is that they contain lutein and beta-carotene, which keep your retina stay in healthy condition. Keeping your eyes healthy is especially important in today’s world where we spend our days glued to various screens – smart phones, laptops, computers, tablets, TVs, movie screens, video games, etc. – under artificial lights indoors. So drink up your carrot juice! Your eyes will be sure to thank you. If you are worried about the sweetness of carrot juice, don’t be. Carrot juice actually can regulate your blood sugar. It is loaded with carotenoids, which are plant-based pigments full of antioxidant properties. They lower your blood sugar and keep it at a normal level. Carrot juice is a powerful source of vitamin A, which protects damaged skin cells and keeps your skin hydrated. Say goodbye to wrinkles and lines, say hello to youthful and glowing skin. Carrot juice is also effective for psoriasis and other skin conditions. 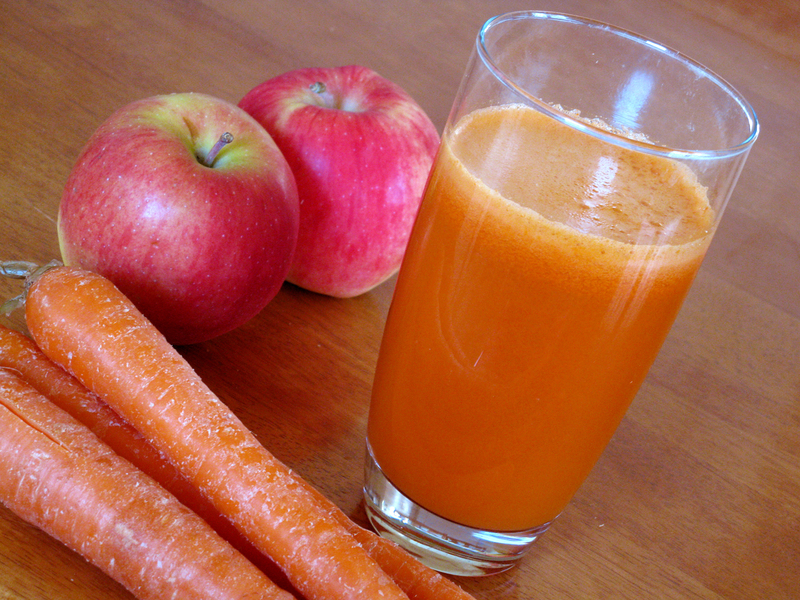 Besides providing you with youthful skin, carrot juice can also help your complexion glow. It can help your liver to detoxify your body, which helps make your skin look bright and clear. Carrot juice also gives your complexion a slight orange hue that can make you look suntanned even in the winter time. No, you will not turn orange like Garfield, simply bright and healthy. The carotenoids in carrot juice are loaded with antioxidant properties that can keep away cancer cells. It is associated with being effective against colon, bladder, cervix and larynx cancer. The Gerson Therapy that seems to be a powerful alternative treatment for cancer also uses a plentiful amount of carrot juice in the protocol. Carrot juice is full of potassium that is known for potentially lowering your bad cholesterol. It is also full of fiber that is incredibly healthy for your cardiovascular system. Now you see how powerful carrot juice can be? It is also yummy – I dare you to try it! Just grab some carrots and juice them! Seriously! It’s THAT easy! Peel 3 – 5 carrots and run them through your juicer. Then drink it slowly. You can also make other juices using carrots as an ingredient. Process ingredients through juicer and enjoy. As always, it is the best to buy organic carrots. Always wash and peel them before juicing. How Much Carrot Juice Should You Drink? There is no minimum or maximum amount. Of course, I don’t recommend you to drink carrot juice all day long – it is important to eat a balanced, whole foods diet. The Harvard School of Public Health recommends limiting your juice intake to 4 oz a day, however, carrot juice is very healthy for you. Don’t overdo it, but one glass a day or several times a week can only benefit you. If you are on the Gerson Protocol or another special diet, you may be drinking much more than that. Should You Still Be Juicing Vegetables? In addition to juicing your carrots, you can’t forget about your greens. Green juices, green smoothies, salads and sauteed leafy greens are all your friends. If you don’t have time to juice, you may want to check out the Organifi Green Juice Powder – it tastes super awesome, is easy to make (just mix it with water) and is FULL of nutrients. You can find it right here in our store. In the meantime, tell us about your favorite recipes with carrots – juice or other. Share them in the comments below!